New Zealand luthier Joh Lang's motto could be: "And now for something completely different!" 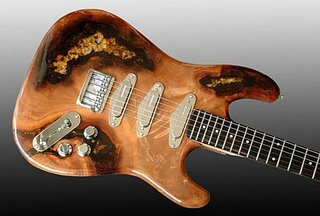 The body of the guitar pictured is carved from a wood called "Kauri" that is 35,000 years old! This is beautiful stuff, and Lang's website has plenty of photos! I don't know how resonant it is, but Lang seems to be a pickup wizard too, and builds some kind of special low impedance pickups. Yes, I said 35 THOUSAND years old! They have the carbon dating certs to prove it. 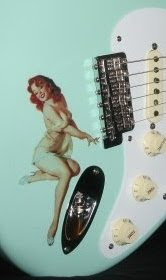 Watch for a Fred Flintstone signature model! Lang is anything but conventional-- but he nonetheless knows the Strat shape is a winning platform for his creations. Legendary Dutch guitarist Jan Akkerman is endorsing the Langcaster guitar line. Lang's headstock designs are another story-- and as we all know, the headstock thing really gets me going. But I promise to spare you here. You'll either love it or hate it-- there is no in between. This Kauri wood is just mind boggling stuff! Click Here for the full scoop on Kauri wood.